LiPo batteries and RC cars go hand in hand. In fact, most drones and RC vehicles use LiPo batteries to power themselves. However, as you might be aware, they tend to run the risk of catching fire and exploding. To mitigate the risk and eliminate the hazard, you can use fireproof battery bags. But, what exactly are they? And how to choose one? Well, we have extensively researched and reviewed some of the best LiPo battery bags in the market. Out of these the following five really stood head and shoulders above others. 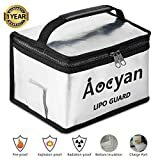 What are LIPO Charging Bags? You might wonder why exactly do LiPo’s require charging bags. While you can use any Lithium-ion charger for Li-Po batteries, it can be dangerous. Li-Po batteries run the risk of fire and explosions while they are charging. The main concern is due to faulty charging or poor craftsmanship. For example, if you do not charge the battery at the proper voltage, it has a higher chance of exploding. A charging bag is basically a flameproof and explosion proof bag that keeps you safe while your LiPo battery charges. However, we highly recommend that you use it for storing and transporting LiPo batteries as well. These bags usually include materials that are flame retardant or fireproof. This way even if your battery catches fire or explodes, you can rest assured that you will remain safe. This is because these materials block the fire and prevent it from escaping. As we already explained, LiPo batteries are quite volatile and they can explode in a number of occasions. These bags protect you in every way by isolating the incident as much as possible. LiPo batteries need to be handled extremely carefully otherwise, you run the risk of a fire hazard. While charging, they tend to be the most dangerous. A high-quality Safety Bag ensures that your battery remains safe and any fires are successfully averted. Carrying LiPo batteries by hand can be quite dangerous. In fact, traveling with them in a car can lead to fire due to the internal heat. The heat blocking materials of the LiPo bag prevent the battery from ever catching fire. Many airlines require you to travel with these batteries in a bag. Storing these batteries outside might also result in accumulated heat. Thus, it is best to use a high-quality storage bag that blocks all heat out. There’s a wide variety of charging bags present in the market. How do you choose the one that’s best suited for an RC car enthusiast like you? The following major factors are crucial to consider. One of the most important factors to consider is the size. Ensure that the size of the bag is sufficient to store and charge the batteries you have. For example, if you have many RC cars and LiPo batteries, then going for a larger one might be more suitable. On the other hand, if you have only a handful and you do not plan on expanding them, then a smaller one will suffice. Otherwise, you could end up with a large bag that is too hard for you to carry. Another crucial factor is durability. You need to ensure that the materials are durable. Mostly, the material used to retard the flames is fiberglass nylon. Other materials are used as an exterior lining on top of the fiberglass nylon so that it isn’t irritating. These can include silicon and aluminum. Most bags include a double zipper that might be made out of plastic. The plastic construction can easily melt due to high temperatures. If the zippers melt, there’s a high chance that flames may escape. Also, when you charge the batteries, there might be an open space through which you draw out the wires. This may also lead to the flames escaping the bag. To ensure proper security of the bag, look for separate ports for charging and Velcro straps over the zipper. Thus, even if the zipper fails, you still have another layer of protection. While it’s true that LiPo batteries can be a huge hazard, you can easily mitigate these risks by following the proper procedures for charging. Read all the instruction leaflets included with the battery. If it doesn’t come with one, check the manufacturer’s websites or check what users are saying in their reviews. Don’t forget to test your charger out. Also, read all instructions related to it. Check the manual for the accurate charge rate and set it at that. In addition, set the correct polarity. Put the battery inside the safe bag for charging. Attach all the charging leads to the battery. Remember to place the bag on an insulated surface that is dry. If the bag contains a separate port, put the leads through there. Close the charging port with the Velcro. Also, close the zipper ensuring there is no space for any flame to escape. Never buy used LiPo batteries as you don’t know how the previous owner might have used them. Now that we have a good idea of the safety precautions needed to charge LIPO batteries, lets take a look at some of the best lipo battery bags available. The Aocyan Fireproof LiPo Bag is a high-quality carrying bag which is perfect for all kinds of LiPo batteries. Its construction includes high-quality materials including 100% fireproof fiberglass fabric as well as an aluminum coating. Also included is a thick layer of thermal insulation at the bottom. This ensures that the bag can easily contain and prevent any fires. Furthermore, the bag features strong and sturdy stitching that will not melt in the face of fire. Another remarkable feature is the PU and nylon handles that make the bag easy to carry. The comfortable grip is an added bonus. Moreover, you can easily fold the bag when not in use. The side of the Safe Bag also includes a port through which you can charge your LiPo batteries. You can cover the side with a Velcro strap. In addition, the bag has plenty of room so you can store any type of battery. The capacity is 8.2 x 6.3 x 5.1 inches. DOUBLE ZIPPER : Double zipper make the lipo safe bag well sealed and convenient to use. 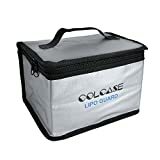 At an affordable price, the Colcase Fireproof LiPo bag puts your safety above everything else. With high-quality and durable materials, it is a must-have for any RC freak. The bag pulls all the stops to ensure safety from fire and explosion hazards. The inner surface of the bag includes fiberglass construction that prevents 100% of all fires. In fact, it can easily withstand temperatures of up to 1000 deg F.
Also, the outer surface includes an aluminum coating that ensures you don’t get annoyed by the fiberglass materials. The bag includes a double zipper which allows you to perfectly seal the bag so no fire can escape. The nylon handles make it easier for you to carry it around and store it while it charges. The best part about the Colcase Safe bag is that it includes a large capacity of 8.2 x 6.3 x 5.1 inches. This means you can place multiple batteries in the case including plane, car, and boat LiPo batteries. 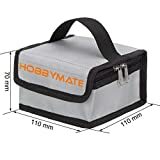 If you’re looking for a heavy duty safe bag, then the Hobbymate is your best bet. With the latest materials and an easy to carry design, it is by far the best bag in the market. An important feature in the bag is the heavy-duty closure that allows no flame or heat to escape the bag. The Velcro closure, as well as the two zipper, ensures that the bag contains all hazards within itself. Included are vents that help reduce the pressure that builds up with heat and flames. To actually contain the fire, the bag includes a fiberglass construction both inside and outside the bag. However, users are mostly concerned with the irritation that fiberglass causes. Although, it may go away, it tends to last for days. So, the bag includes a fire retardant coating on the outside so you don’t have to come in contact with any irritants. Also, the bag includes a large capacity so you can store multiple batteries while they charge. For instance, you can easily charge about 15-20 small 2200mAh Li-Po batteries. 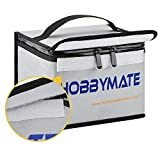 If you want the high quality of the Hobymate bags, but at a smaller size or an even more affordable price, then the mini size might serve you perfectly. It includes all the basic features of the full sized bag including the durability and reliability. The only difference is that this one is available in a smaller size. Although this is the mini version, it can still hold multiple batteries. For example, it can hold about 4-5 1600 mAh batteries. The total size of the bag is 110 x 110 x 70 mm. The bag’s interior and exterior includes a fiberglass nylon construction. The main purpose of the material is to retard any flames and to contain explosions. However, the exterior is coated with another fire retardant material that eliminates any irritation caused by the fiberglass material. Apart from this, the bag comes with a Velcro and a zipper closure to ensure no flames escape the bag. It also ensures that no more oxygen enters the enclosure. In addition, there are vents to help reduce pressure buildup due to the heat. The Engpow Explosion-proof Safe Bag is the best and most convenient way of storing and charging LiPo batteries. In fact, it is a versatile bag which is not only for charging LiPo batteries. You can use it to transport various types of batteries, mobile phones, chemicals, lighters, and chargers. 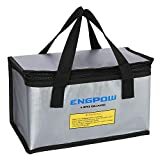 The Engpow Safe Bag includes silicon coated fiberglass that retards and contains fire while ensuring your skin remains safe from irritation. The interior of the bag is lined with aluminum that blocks off heat. This ensures you and your family are always safe. Storing multiple batteries is not a problem anymore. The large capacity of the bag is about 260 x 130 x 150 mm. This means you can store multiple batteries, about 30 pieces of 2200 mAh batteries. In case, you get a faulty bag or find flaws in workmanship, the manufacturers offers a 2-year warranty so you can get your money’s worth. All in all, all our top 5 choices are the absolute best and will ensure your ultimate safety. However, if we had to choose one, it would have to be, hands down, the Aocyan Fireproof LiPo Safe Bag. This bag boasts of high-quality materials that are 100% fireproof. The bag easily contains and retards any flames. Not only that, but it is quite easy to carry due to the PU handles. Its large capacity ensures that you can easily fit multiple batteries at the same time. Furthermore, it includes a charging port at the side which allows you to charge in a more secure manner. If you’re an RC enthusiast, then you can’t say no to the premium quality and the affordable price of the Aocyan Safe Bag. Let’s face it! You can’t put a price tag on safety!